In pharmacology, partial agonists are drugs that bind to and activate a given receptor, but have only partial efficacy at the receptor relative to a full agonist. 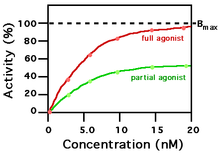 They may also be considered ligands which display both agonistic and antagonistic effects—when both a full agonist and partial agonist are present, the partial agonist actually acts as a competitive antagonist, competing with the full agonist for receptor occupancy and producing a net decrease in the receptor activation observed with the full agonist alone. Clinically, partial agonists can be used to activate receptors to give a desired submaximal response when inadequate amounts of the endogenous ligand are present, or they can reduce the overstimulation of receptors when excess amounts of the endogenous ligand are present. Some currently common drugs that have been classed as partial agonists at particular receptors include buspirone, aripiprazole, buprenorphine, nalmefene and norclozapine. Examples of ligands activating peroxisome proliferator-activated receptor gamma as partial agonists are honokiol and falcarindiol. Delta 9-tetrahydrocannabivarin (THCV) is a partial agonist at CB2 receptors and this activity might be implicated in ∆9-THCV-mediated anti-inflammatory effects. ^ Calvey N, Williams N (2009). “Partial agonists”. Principles and Practice of Pharmacology for Anaesthetists. p. 62. ISBN 978-1-4051-9484-6. ^ Zhu BT (April 2005). “Mechanistic explanation for the unique pharmacologic properties of receptor partial agonists”. Biomedicine & Pharmacotherapy. 59 (3): 76–89. doi:10.1016/j.biopha.2005.01.010. PMID 15795100. ^ Atanasov AG, Wang JN, Gu SP, Bu J, Kramer MP, Baumgartner L, Fakhrudin N, Ladurner A, Malainer C, Vuorinen A, Noha SM, Schwaiger S, Rollinger JM, Schuster D, Stuppner H, Dirsch VM, Heiss EH (October 2013). “Honokiol: a non-adipogenic PPARγ agonist from nature”. Biochimica et Biophysica Acta. 1830 (10): 4813–9. doi:10.1016/j.bbagen.2013.06.021. PMC 3790966. PMID 23811337. ^ Atanasov AG, Blunder M, Fakhrudin N, Liu X, Noha SM, Malainer C, Kramer MP, Cocic A, Kunert O, Schinkovitz A, Heiss EH, Schuster D, Dirsch VM, Bauer R (2013). “Polyacetylenes from Notopterygium incisum–new selective partial agonists of peroxisome proliferator-activated receptor-gamma”. PLoS One. 8 (4): e61755. Bibcode:2013PLoSO…861755A. doi:10.1371/journal.pone.0061755. PMC 3632601. PMID 23630612. ^ “PHARMACOLOGICAL PROPERTIES OF THE PHYTOCANNABINOIDS ∆9-TETRAHYDROCANNABIVARIN AND CANNABIDIOL – Phd thesis of: Dr. Daniele Bolognini – PDF” (PDF). 2010.